For the next few weeks I’ll be exploring the tenuous relationship between faith and reason in a sub-series I’m calling “Expecting Ambiguity“. My aim is to explain how philosophical arguments for the existence of God are not as concretely determinate (and thus as easy to dismiss) as they are often cast, but that they instead offer as much insight into the limits and powers of subjective human knowledge as they do into religion. And because of finals and grading, this week we have a very special Saturday installment of Philosopher Fridays. ANSELM: Saint Anselm of Canterbury was one of the earliest scholastic theologians. 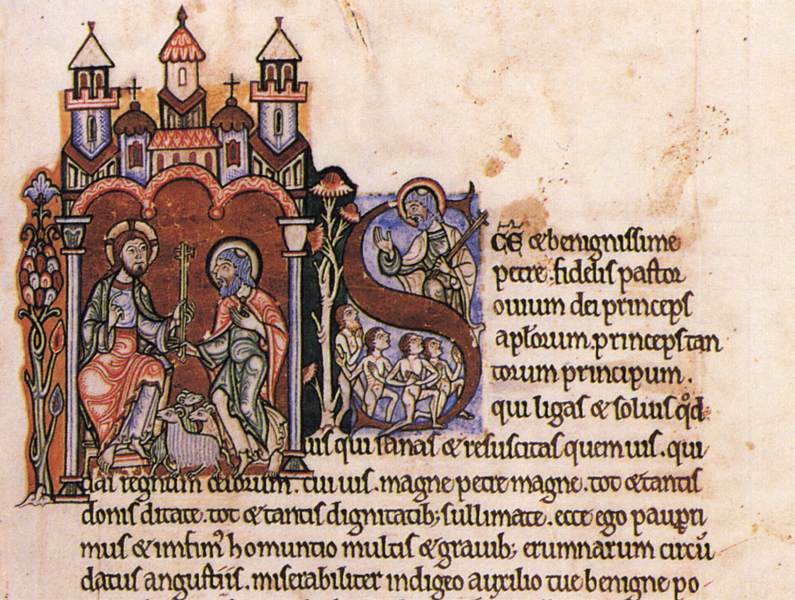 Born to a noble family in 1033, Anselm was initially denied the chance to choice a monastery by his father at the age of 15. After suffering psychological illness and the death of his mother, he left home at the age of 23 to pursue his dream without his father’s consent, and joined the Benedictine order. He was exiled from England a few times because of monarchical and papal power disputes and died in 1109. What he is best known for, however, is his proof for the existence of God: the Ontological Argument of chapters two and three of the Proslogion. Written in 1077 as a meditation on the existence of God, the Proslogion – originally titled Faith Seeking Understanding – was contentious from the start. The text is almost universally published with its earliest critical commentary, written by monk Gaunilo of Marmoutiers and followed up by Anselm’s own reply to this rebuttal. I will go through the proof, and then address some of its criticisms. If the phrase “that than which nothing greater can be thought” can be understood, then this concept can be said to exist in the understanding. That which exists both in reality and in the understanding is greater than that which exists only in the understanding. Thus that than which nothing greater can be thought cannot exist solely in the understanding, because if it were only to exist in the understanding, then we could think of something greater – and we would no longer be describing something than which nothing greater could be thought. Therefore, that than which nothing greater can be thought must exist in both the understanding and in reality. Further, if it is possible to think that something can exist which cannot be thought not to exist, then surely that which cannot be thought not to exist is greater still than anything which can be thought not to exist. Therefore, that than which nothing greater can be thought doesn’t just exist in both the understanding and in reality – it cannot be thought not to exist. And he finishes the argument by saying “And this is you, O Lord, our God” (Ch 3). God is the greatest thing that can be thought. Since it is greater to exist in reality than just in thought, the greatest thing must exist in reality. With this change, critiques come quickly and easily. Guanilo’s “perfect island” objection (the early commentary mentioned above) stems from this notion, stating that in imagining a perfect island, you could easily keeping imagining something to make it better without that better thing ever coming to be in reality, thereby nullifying the necessity of static perfection. If one God is the greatest being that can be conceived, then two Gods would be even greater, and then God would not be the greatest possible being, and the entire thing would fall apart. Perfection in God cannot imply existence any more than perfection in an island. In the Latin, the definition of God is always framed in open-ended terms, as aliquid quo maius nihil cogitate potest (that than which nothing greater can be thought), aliquid quo maius cogitari non valet (that than which something of greater worth cannot be conceived), or aliquid quo maius cogitari non potest (that than which something greater cannot be thought). He later asks “What are you, if not the greatest of all beings…?” (ch 5), but he never settles on anything concrete. This is explicitly not something definite or static, but rather something unlimited and indefinite. To change the definition in this way is more than just reductive – it completely erases the major theological heart of the Proslogion. The real goal of the text, as I see it, is not to prove the existence of a specified and delimited God, but instead to wonder at the notion of God as something which exceeds human understanding. He’s meditating explicitly on our temptation to simplify God and reality into concrete terms and seeking the limits of human understanding. The chapters that follow this proof are primarily questions about what appear to be contradictions, questions about what it means to seek something with no apparent limit, and finally statements about eternity, timelessness, and limitlessness. This isn’t merely a defense of faith, it’s a celebration of human creativity. Anselm recasts our infinite distance from God in a positive light; rather than lamenting how far we are from perfection and bemoaning the ambiguity of faith, he instead rejoices over how far and how freely we can travel when we leave behind our own limits. If we focus solely on what we can contain (concrete, definite ideas) we will deny ourselves the chance to jump into something than can contain us – something in which there is infinite possibility. There are, of course, some more substantial critiques of an epistemological nature. Kant’s critique of Anselm’s assumption that existence can be cast as a predicate and Hume’s critique of a priori knowledge are both worth some time and exploration. The implications of these critiques far outreach the scope of this post, however, and I’ll save them for another day. What Anselm calls the divine, others may call wonder or doubt, but the claim is the same: that we can always know more than we can rationally explain, we can always feel more than we can put into words, we can always discover more than our dominant paradigm can account for. The God that Anselm proves is not something concretely determinate, but instead something which renders knowledge, creativity, and growth without limit. Its very helpful to keep in mind the neoplatonism within which Anselm works – the OA can really be seen as a mystical excercise, the mind ascending to the higjest form of the good, which can never be comprehended. Often these historically famous philosophical arguments are based around notions of infinity (or the infinitesimal.) Infinity is a rocky place where philosophical discussions are easily wrecked. It needs to be approached very carefully, and with a more sophisticated understanding than was available to writers like Anselm and Zeno, for example. The OA reminds me of discussions I held with my children when they were about 8 years old. It also reminds me of how, as a child, I came to see belief in God as preposterous. Ancient and Medieval thinkers who were in the process of developing sophisticated notions may not have been able to express them to our modern satisfaction, but to say they were like children because they didn’t have the modern conventions they were in the process of developing – ideas we take for granted – is obviously an exaggeration. My point here is that in the Proslogion Anselm seems to be opening up the concept of infinity beyond the simple version that was available to him at that time – his definition of God involves what I think is an important shift from a static, simple, inaccessable concept of infinity to a concept of infinity that had room for multiple infinities, for an infinity that could be found anywhere and which could be intellectually engaged with. I was not intending to belittle thinkers like Anselm. What a lively interpretation! Thank you! I hadn’t really appreciate the force of this argument until now. I too felt the need to start cutting words and premises out of his argument to streamline it. I would have ended up with something like the second argument, which you’ve shown to be lacking. It’s clear that Anselm had carefully constructed this and we have to be careful with our language in our recasting. It seems he means that concept of the unlimited is unique to the concept of God. So as you say, comparing such an idea to a perfect island is missing the point. The idea of a perfect island does not encapsulate a never-ending perfection, since an island—perfect or not—is a limited concept. We could imagine two perfect islands, or things that are greater than islands that are also perfect. But the language he uses is interesting. He doesn’t talk about a “perfect” God, which brings to mind something static. If we substitute “unlimited” with “perfect” we have a clearer sense of the absurdity in positing two Gods. Thinking of such things brings to mind children who try to outdo each other by saying things like “infinity times two”, or “infinity times infinity”. The beauty of this argument is that no other example can really compete with the concept of God, since by definition nothing genuinely compares. Thank you for your kind words! I’ve always loved this argument for what it says about the human intellect. I also find Kant’s critique fairly compelling, and Hume’s critique incredibly interesting, but that doesn’t negate how much I love the idea of limitless human creativity. I also really like how Anselm (and all of the proofs I’ve chosen for this series) flip the argument – it’s not that God is an incomparable concept, it’s that whatever could be an incomparable concept is what we should call God. It’s got a delightful amount of wiggle room while still being reverent and humble. It’s essentially delighted doubt, happiness in the face of the infinite distance from “perfection”, looking at what we do not and possibly cannot know and saying – hey, that means I can keep trying forever and won’t ever be done! Anselm could almost be describing the philosophy of science. Thank you so much – I appreciate your kind words, and I rather agree with you! A few months ago I began following Michelle Joelle’s blog ‘Stories and Soliloquies.’ She has many good thoughts, and one of her series that I have found especially joyful have been her ‘Philosopher Fridays.’ In this recent installment of her series, she highlights (beautifully, I might add) Anselm of Canterbury who is infamous for the ontological argument in apologetics. Thank you for the reblog! It’s an honor. Hooray! What a wonderful meditation on Anselm’s Ontological Argument! I especially appreciate your Via Positiva, using Anselm to help us escape the limits of rationalist, positivist thought. I hinted at this idea when I wrote my post on Anselm’s argument, but I didn’t go that direction. I posited that any ‘thing’ that is greater than anything that can be conceived is not limited in the same way that any ‘island’ would be. So since an Island is a concrete entity and I could imagine a greater non-island, that thing would be greater. I always thought that was what Anselm was trying to do. That no matter what you encountered or imagined or conceived, God is better and greater than that. I hadn’t considered it as a sort of…exercise in mysticism. That’s an interesting thought, thank you. Well now I’ve got to go and revisit your post on Anselm – it was likely in my mind when I wrote this, whether I knew it or not. I always thought of Anselm as saying that our creativity is what we have in us that is “God’s image”. As we can continually seek greater and greater perfections ad approach limits without ever reaching them, we exercise that capacity within us – it’s sort of a practically motivating mysticism, and not a purely contemplative one.